With more than 75 years of industry experience, Goulston is a market leader in the chemicals sector. While much of our experience and history is in the synthetic fibers area, we also have developed expertise in other surface modification technologies. Our mission at Goulston is to be the global leader in surface modification technologies by providing our customers with innovative products and services that are consistently superior in technology, quality, performance and value. This Open House Event will include presentations, a facility tour, and Brewster’s Ice Cream for attendees. Attendees must register for the tour–walks ins will not be able to attend. ALL ATTENDEES MUST WEAR LONG PANTS AND CLOSED TOE & CLOSED HEEL FLAT SHOES FOR SAFETY. NO HIGH HEELS and NO SLEEVELESS SHIRTS ARE ALLOWED. Unfortunately, any attendees not properly attired will not be able to take the tour. Attendees must have a parent or guardian present if under the age of 16 years old. Greiner Bio-One North America, Inc., an international medical technology company, will provide presentations, facility tour, and light refreshments for attendees. Attendees will experience the latest technology for producing products used in Preanalytics and BioScience fields. Attendees must register for the tour — walk ins are not accepted. ALL ATTENDEES MUST WEAR LONG PANTS AND CLOSED TOE SHOES FOR SAFETY. NO HIGH HEELS. Unfortunately, any attendees not properly attired will not be able to take the tour. Attendees must have a parent or guardian if under 16 years old and all attendees must be at least 11 years old. GM Nameplate, a leading international manufacturer of custom manufactured components and assemblies, will provide presentations and a facility tour for attendees. Attendees will experience a variety of manufacturing processes used to produce a multitude of products. Attendees must register for the tour — walk ins are not accepted. ALL ATTENDEES MUST WEAR LONG PANTS AND CLOSED TOE, FLAT SHOES FOR SAFETY. NO HIGH HEELS. Unfortunately, any attendees not properly attired will not be able to take the tour. Attendees must have a parent or guardian if under 16 years old. Visit South Piedmont Community College’s Tyson Family Center for Technology on Tuesday, October 2nd to learn how high school-age students can receive college-level training TUITION-FREE starting as early as the 9th grade. Learn about Career and College Promise, which allows eligible high school students to enroll in available college-level pathways covering high-demand career fields such as technology, engineering, manufacturing, and skilled trades. Experience hands-on learning activities in programs such as mechatronics, electrical systems, machining, heating and air conditioning, and welding. Find out how Career and College Promise compliments the Academic Pathways and Apprenticeships available in local high schools. Tour the Tyson Family Center for Technology. Darnel provides an extensive line of food packaging and recyclable tableware manufactured with quality in mind. For more than 30 years, Darnel has been at the forefront of research and development, quality and customer service, allowing for continued growth across the globe. Darnel’s laboratories are equipped with the latest technology to ensure the quality of their products. Attendees must register for the event–walk ins will not be able to attend. ALL ATTENDEES MUST FLAT, CLOSED TOE SHOES. NO HIGH HEELS. Attendees may wear short sleeves. Unfortunately, attendees not wearing the proper attire will not be able to tour the facility. Attendees under the age of 16 must be accompanied by a parent or guardian. 3M Scott is a premier manufacturer of innovative respiratory and personal protective equipment and safety devices for firefighters, industrial workers, police squads, militaries, homeland security forces, and rescue teams around the world. With five global manufacturing locations, 3M Scott products protect thousands of individuals each day from environmental hazards including smoke, toxic fumes, combustible gases, falling objects, and contaminants. This Open house Event will feature presentations and a tour of this state-of the-art facility. Attendees MUST register–walk ins will not be able to participate. ALL ATTENDEES MUST WEAR LONG PANTS, LONG SLEEVES, AND CLOSED TOE, FLAT SHOES. NO HIGH HEELS. Attendees not properly attired will not be able to tour the facility. Participants under the age of 16 must be accompanied by a parent or guardian and all participants must be at least 11 years old. All attendees must be US citizens. Norton Door Controls offers a comprehensive line of door controls designed and manufactured to ensure superior performance and reliability. Today, Norton offers traditional surface, industrial economy, overhead concealed, commercial and architectural grade closers. This Open House Event includes the opportunity to learn more about this dynamic manufacturer and tour their high-tech facility. Attendees must register to attend the event. Walk ins will not be able to participate. ALL ATTENDEES MUST WEAR LONG PANTS, LONG SLEEVES, AND CLOSED TOE FLAT SHOES. NO HIGH HEELS. Attendees who are not properly attired will not be able to tour the facility. Attendees under the age of 16 must be accompanied by a parent or guardian. Glenmark Pharmaceuticals Inc., USA was established in 2003 as the North American division of Glenmark Pharmaceuticals Ltd. Since the first product launch in January 2005, Glenmark Pharmaceuticals has emerged as one of the leading generic organizations in the US. Glenmark operates 16 manufacturing facilities globally, illustrating their continuous investment to meet the growing demand for their products. In 2015, Glenmark established its first manufacturing plant in the U.S. — a brand new 100,000 square foot leading-edge facility in Monroe. As part of Glenmark’s mission to expand its footprint in the U.S., this new plant will begin by manufacturing oral solids and sterile injectables. Attendees must register for the tour — walk ins are not accepted. For safety purposes, ALL ATTENDEES MUST WEAR LONG PANTS AND CLOSED TOE, FLAT SHOES WITH SOCKS. The following are NOT allowed: high heels, capri/short pants, skirts, sleeveless shirts, nail polish/artificial nails, make-up, jewelry (only medical/emergency tags as well as medical devices will be permitted). Unfortunately, any attendees not properly attired will not be able to take the tour. Attendees must have a parent or guardian if under the age of 16 years old. Charlotte Pipe and Foundry is a leading manufacturer of pipe and fittings and the only manufacturer that offers a complete system of cast iron, PVC, CPVC, ABS and FlowGuard Gold® pipe and fittings for residential and commercial plumbing systems and industrial applications. This Open House Event will feature presentations and a tour of this state-of-the-art facility. This Open House Event is an INVITATION ONLY event–unfortunately, walk ins will not be permitted. ALL ATTENDEES MUST WEAR LONG PANTS AND CLOSED TOE FLAT SHOES. NO HIGH HEELS. Attendees not properly attired will not be able to tour the facility. This Open House Event will include presentations. Attendees must register for the event–walks ins will not be able to attend. ALL ATTENDEES MUST WEAR CLOSED TOE & CLOSED HEEL FLAT SHOES FOR SAFETY. NO HIGH HEELS. Unfortunately, any attendees not properly attired will not be able to participate in the event. Attendees must have a parent or guardian present if under the age of 16 years old. 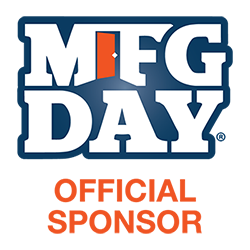 This is a great opportunity to learn more about manufacturing and the exciting high tech processes and equipment used in today’s manufacturing. And it’s a great opportunity to meet manufacturers who are “making” great thins happen in our community. The purpose of this celebration breakfast event is to thank local manufacturing leaders for their contributions to Union County, NC and beyond. This event will include a key note speaker, proclamations of appreciation from local government officials, and presentation of certificates of appreciation to manufacturers who have participated in the week’s activities.